If you are looking to play at a trustworthy poker site that accepts players from the US, there are few sites that rank higher than Black Chip Poker on the Winning Poker Network (WPN). 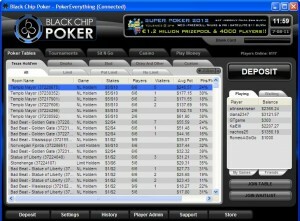 Black Chip Poker has developed a reputation for fair play, fast cashouts and fantastic promotions; and this reputation was cemented in September 2015 when top professional poker player Rupert “John Legend” Elder created an account with Black Chip Poker and then chopped WPN´s “Million Dollar Sunday” for $124,882. Elder´s win received a lot of attention because at the time it was the largest ever online win live-streamed on Twitch. Elder´s 1,200 Twitch followers and 4,800 Twitter followers learned within a week that Elder had received his winner´s cheque – encouraging many more players to feel confident about the integrity of Black Chip Poker. WPN is now the highest rated US-friendly network that allows players to use poker software and that does not insist that they play anonymously. The Black Chip Poker bonus is the highlight of the site´s Welcome Package for new players. Players using the Black Chip Poker bonus code “PNREPORT“ when first registering their accounts will be eligible for a 100% match on their first deposits up to $1,000. The other elements of the Welcome Package include a seat in the weekly depositor´s freeroll, entry into the site´s “Elite Benefits” VIP program and $50 in tournament bucks to play in the site´s exclusive Jackpot Poker games. There is a massive choice of cash games at Black Chip Poker – undoubtedly the most popular being NL Hold´em, where the stakes range from $0.01/$0.02 to $25.00/$50.00. The site has a very active PL Omaha community, and – during peak times – you will also find tables hosting cash games of Omaha Hi/Lo, 7 Card Stud and 7 Card Stud Hi/Lo. At present Black Chip Poker does not have a fast-fold poker game, but it does host hyper-turbo, three-handed “Jackpot” Sit & Go games with some massive prizes. There is a good selection of “regular” Sit & Go games running around the clock, including Black Chip Poker´s popular “On Demand” games – games that start when a certain number of players have registered, and then continue similar to a multi table tournament (MTT). The MTT schedule is quite fantastic – a sensational variety of tournaments that includes the $115,000 guaranteed “Sunday Special” – the most valuable weekly tournaments available to online players in the US – and the previously mentioned $1 million guaranteed “Million Dollar Sunday” that is played five or six times each year. The Elite Benefits VIP Program is one of the best loyalty reward schemes in the industry. At the same time as you are earning Award Points to clear your first deposit or a reload bonus, you are also earning Benefit Points for the contribution you make to the rake deducted from cash game pots or for paying fees to enter a Sit & Go game or multi table tournament. The Benefit Points you earn at the tables determine your status within the VIP Program, and the higher status you achieve, the higher the multiplier applied to your Benefit Points when they are converted into Player Points. Player Points can be exchanged for cash and tournament tickets, or to enter live poker events sponsored by the Winning Poker Network. You will also receive extra bonuses and rewards as you hit certain Benefit Point milestones with a year. Black Chip Poker has a frequently-changing schedule of promotions with two permanent exceptions – The “Beast” and “Sit n Crush”. The Beast is a non-contributory rake race that is hosted at Black Chip Poker every week. Players are awarded “Beast Points” according to their contribution to the rake deducted from cash game, which then accumulate on a leaderboard. The top points´ earners share in a prize pool currently paying out around $50,000 in cash and $20,000 in tournament entries each week. The “Sit n Crush” promotion is also non-contributory and awards points towards a weekly leaderboard position based on the volume of Sit & Go games that you play and their buy-in. Finishing positions have no influence on the value of the points awarded; so, even if you have a bad week playing Sit & Go games, you could recover plenty of your buy-ins through the $20,000 of cash prizes and $7,000 of tournament entries awarded each week at Black Chip Poker. If you are not familiar with creating an online poker account, you have no need to worry – Black Chip Poker makes it as easy as possible. 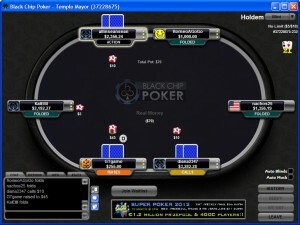 The Black Chip Poker download is compatible with all Windows computers running Windows XP or later. There is no Black Chip Poker for Mac at present (although a beta version is being trialled by the network) and future plans for the site include a Black Chip Poker app for Android devices. To start the Black Chip Poker download, simply visit the site from any of the links on this page and click on the red button that reads “Download Now”. You will be guided through the installation process by a set-up Wizard and there is really nothing for you to do except click “next” a couple of times and read the Terms and Conditions before accepting them. Once the download and installation are complete, the Black Chip Poker client will launch on your desktop and you will be invited to “Create a New Account”. The registration process is straightforward but you should remember to use the Black Chip Poker bonus code “PNREPORT” on the first registration page, and make sure you enter your personal details as they appear on documents you may later use to verify your account. The choice of options for funding your Black Chip Poker account will depend on your country of residence. Not all players will be able to make a deposit into their accounts using Visa or MasterCard, although Skrill and Neteller are usually available, as are deposits by MoneyGram. The most popular method of depositing into a Black Chip Poker account is via Bitcoin and, if you need help negotiating your way around a Bitcoin deposit – or any other type of deposit – live telephone support is available around the clock. Withdrawals from your Black Chip Poker account can only be made after the account has been verified. The purpose of verification is to add an extra layer of security to your account, so it is a good idea to make verification a priority as soon as your account is created. Thereafter, you can withdraw your winnings and bonuses via Bitcoin, e-Wallet, prepaid debit card, cheque or MoneyGram. Some methods of withdrawal have daily, weekly or monthly limits, you are only allowed one free cheque withdrawal each month, and charges apply if you withdraw by MoneyGram. Throughout this Black Chip Poker review, there have been plenty of positives, so why is it rated only 8 out of 10 at the top of the page? Well, there are a couple of things you should be aware of. First of all, Black Chip Poker does not accept players from all jurisdictions. In addition to the regulated US states of New Jersey, Nevada and Delaware, Black Chip Poker does not accept players from Louisiana, Kentucky, Maryland or Washington. Players from some European countries are also prohibited from opening an account with Black Chip Poker because of their local licensing laws. Black Chip Poker got marked down for not having a native Mac client or a mobile app, and for not providing a fast-fold poker game that enables players to earn Award Points and Benefit Points at a faster rate. It was also felt that the games software could be improved in general. Remedies to all of these “complaints” are in the pipeline and, when they are introduced, this Black Chip Poker review will be amended to reflect the improvements to the site. For now, if you are happy playing on a Windows computer and have the time available to take advantage of the opportunities available on Black Chip Poker, we still rate it a very good site. We recommend opening an account, clearing the Black Chip Poker bonus and then seeing what you feel about the site. In the same way as no two poker players are identical, neither are two online poker sites; but we are fairly confident you will have an enjoyable online experience playing at Black Chip Poker.